We just had the time of our lives! No, seriously. Ever since Joomla! 3.x became a stable version, long before the Joomla! Team announced doing away with the Long Term & Short Term release cycles, we tried our hand at upgrading our site from the current 2.5.x version to 3.x. Needless to say, every attempt resulted in the infamous "White Screen of Death"! And believe me, we tried many times. Due to our resource limitations and lack of available time to work on our own site, the update was tabled for a later date. Because we were starting from the beginning, we could do what ever we wanted. Right? Well, we took a look at what was currently on our site to decide what we 'needed' (must haves) and what we 'wanted' (nice to haves). We also had to ask, "what can we do better" (improvements). After our research and making all the decisions needed, we set out to create our new site. With our list of 'must haves' in our pocket, we were fortunate to find a new template to help with our first two requirements and one of our 'Nice to Haves". We chose a template from the folks over at RocketTheme which gave us the Clean Look our new site needed. The new template also gave us an Easy to Navigate site with built in Responsiveness because of the Gantry Framework that is included with every RocketTheme template. Continuing with our list of 'must haves', we looked at the content manger that he have been using for the past few years - Zoo, from the folks over at YooTheme. During our initial set up and tweaking, we had issues connecting to the Zoo content, and since K2 is fully integrated with RocketTheme, we made the switch. You may be asking yourself at this point "Why didn't they keep Zoo and just go with a YooTheme template?". Frankly, we chose RocketTheme based on their many selections and we liked the look of the template we chose. It was also apparent that K2 was a cleaner and easier to use content manager than Zoo. One thing we did not like about Zoo was the use of 'applications' that were required to display different types of content. In the beginning when we first chose Zoo, we thought that was a great idea. To have separate apps that could be customized for the type of content you wanted to display. We even ended up using Zoo for one of our clients and replaced 4 different custom components that we had built for them. So don't get me wrong, Zoo is a great product. We just felt that moving forward, we wanted more simplicity, and decided upon K2. By leveraging off K2 and the RocketTheme extensions, we could easily integrate our content without fuss. On our old site, the process was much more difficult. K2 was a happy solution to allow us to create our Products Pages with a clean new look. Although there wasn't a perfect migration path from Zoo to K2, we worked our magic and took the Zoo CSV export, imported into a custom tool that we made, massaged the data, then exported as SQL so that we could then import right into our MySQL K2 tables. Worked like a charm! We talked about adding Responsiveness to our site and at this point we should mention, in this day and age, we really should have put this under 'Must Haves'. Thankfully, the ease of using the Gantry Framework made this a no-brainer. Since it was already part of our new template, we just did the dirty work to get it all positioned correctly. This also required incorporating the different parts of our site that needed to be responsive, beyond just moving items around for the type of device the site is being viewed on. As for an FAQ, we have never had one before. However, adding one to a new clients site recently gave us the opportunity to rethink why we didn't have one. We realize you can add questions and answers in a Joomla! article, but we found this handy little tool that not only makes it easier to add and update our FAQ, but looks great in the process. We're talking about FreeStyle FAQ! If you need an FAQ system on your site, give them a whirl! Why did we need Fewer 3rd Party Extensions? Because that was actually the main issue with our site upgrade that forced us to begin again. We're not saying that 3rd party extensions are bad. Of course NOT! JoomLadds is a 3rd party developer. Just that there are good ones and not so good ones. When you find a great extension that fills a need, dig a little deeper. Do they update their extensions regularly? 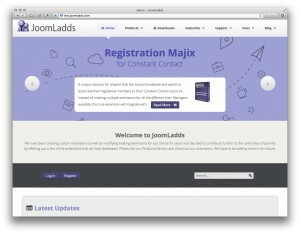 Do they keep up with the ever evolving world of Joomla!? Sadly, we decided to use a few extensions on our site that frankly just didn't cut the mustard when it came time to upgrade our version of Joomla! Our site broke and it wasn't fun. DOCman is a great product, don't get me wrong. However, because JoomLadds is primarily a software developer, we need to deliver our extensions in the best manner possible. We found that DOCman just didn't fill that need any longer. We beta tested their latest version (2.0) and felt that we needed something more. Well, once again, the great folks over at AkeebaBackup.com came through for us! We converted our Downloads area to use the Akeeba Release System and we're so glad that we did. Not only do we think its easier to find our extensions now, the way they handle older versions is spot on! We really like the way they create the backend XML files for use with the Joomla! Update Server. Now we can offer updates to our Club Subscribers too! Lastly, it goes without saying that we had to Replace Our Existing Template, but wanted to point out that it was partly responsible for our "White Screen of Death". So when you are out there looking for new extensions, take the time to find the right ones. We had the old thought "Why should I pay for something, when I can get it for free". We had to realize that good - no, great! - software is worth its weight in gold. 2 words: Updates & Support!!! The launch of our new site was a slow and tedious process. We had hoped for a quicker turn-a-round, but the final product has proven "you can't rush perfection". Ok, we admit, our site isn't perfect and I'm sure that our users will still have comments and suggestions to improve upon it, but we are pretty darn happy with the results!